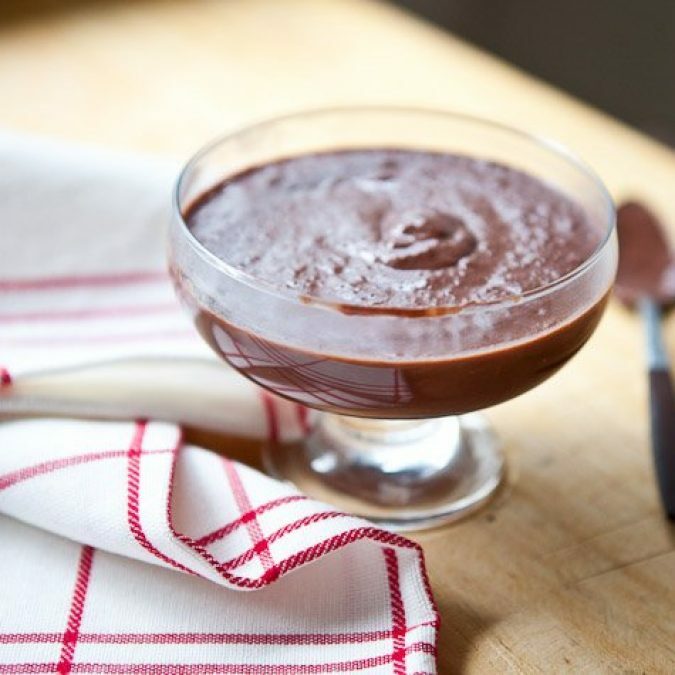 In a small bowl, combine the cornstarch, sugar, cocoa powder and salt. Heat the milk and cream in a small heavy-bottom saucepan over low heat until little tiny bubbles form around the edges, but not fully boiling. Crack the eggs in a small bowl and whisk. While whisking the eggs, pour a touch (roughly 1 tablespoon) of the hot milk into the bowl to temper them (so your eggs don’t get clumpy and cook when you add them altogether). Stream in a little more milk, whisking continuously to temper the eggs. Pour in a little more milk, and then go ahead and pour the egg mixture into the saucepan. Next, add the dry ingredients to the saucepan and whisk until combined. Continue cooking over low heat and stirring to avoid sticking or clumping until the pudding thickens, about 15 minutes. You’re looking for it to coat the back of a spoon. Add the chopped chocolate and stir until it melts. Take the pan off the heat and stir in the vanilla. Strain the pudding with a fine-mesh strainer to remove clumps. Cover with a layer of plastic wrap and let cool before serving.